South Africa's veteran pacer Dale Steyn's cricketing career has been in a bit of struggle over the past couple of years. His career highlights have involved injuries more than achievements on the field in this phase. Despite being aware of the tiny factoid, Steyn is positive that he can clock the magical number of 100 Tests, and also gun down 500 wickets with the red ball before he thinks of bidding adieu to the game. Steyn was well on his way to becoming South Africa's leading Test-wicket-taker in the 2015s and 2016s, also having reached 400 wickets before 2017 set in. But then he started getting plagued by repeated injuries, and somewhere down the line, his career could not resume the flight. Nearly two years later, Steyn's tally has grown only by 21 wickets, and he is still one short of becoming South Africa's biggest Test-wickets-taker. He has played in 88 Test matches so far. 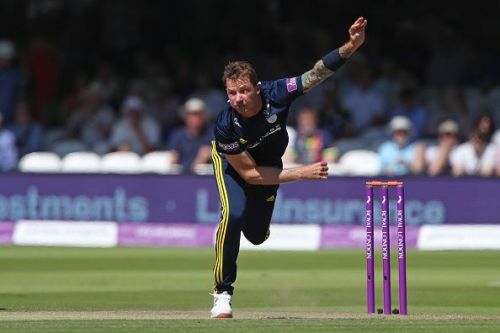 After the recent Sri Lankan tour where he couldn't do much in the spin-favouring grounds, Steyn came to England where he went on feature in Hampshire's games in the County Championships. It seems like he has found a lot of his verve back, as explained by the impressive numbers he has racked up- 20 wickets in five matches. In a recent interview with the BBC, Steyn said: "I've really enjoyed playing here, but I’ve still got a lot to offer in international cricket," before adding: "There are 500 Test wickets and 100 Test appearances that I would still like to achieve." Despite the desire, he is still unsure of whether the Proteas will bank on him in the coming years - not to mention that he turns 37 very soon. "The reality is they’re both going to be quite difficult to achieve and will take me some time, possibly another two-and-half years. Will South Africa still want to pick a 38-year-old by then? I don’t know,” he said. He also sees playing in the County games as a backup option. "I’m not going to be plying my trade with South Africa, then why not here?” he clarified. Dale Steyn has put his Hampshire stint on pause as he will now be returning to his home country to prepare for the upcoming ODI series against Zimbabwe. The series starts later this month, and South Africa's premier bowling spearhead wants himself fully fit and ready to go before the games.